US military officials have publicly recognised this contribution of the ceasefire as helping to stabilise parts of Iraq. Other key developments that have helped reduce the violence have been the surge of US troops in and around Baghdad, and the emergence of US-backed Sunni militia who have taken on al-Qaeda in Iraq in western areas of the country. Deputy Iraqi Prime Minister Barham Saleh praised the move. 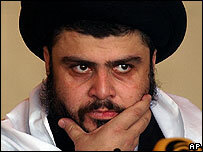 "This suspension will culminate in the dissolution of armed groups. The political process and the rule of law should be the basis for arbitrating our differences, not militias," Mr Saleh told the Reuters news agency. In a statement the US military said the truce extension would allow security forces to focus on combating al-Qaeda. With the approach of the Saturday deadline for the expiry of Moqtada Sadr's original ceasefire tension and speculation had mounted over whether it would be extended, our correspondent says. Since the original ceasefire was announced American and Iraqi forces have kept up a drive against what they regard as rogue elements of the Shia militia who did not abide by the truce. 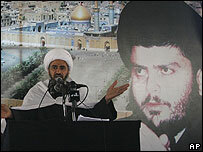 Spokesmen for the Sadr movement said that any members who did not obey the order would be expelled. Also on Friday, a ban was imposed on horse-drawn carts and other wagons pulled by animals in Baghdad, after one was used in a bomb attack. Three people were killed when explosives hidden in a cart were detonated in the centre of the capital. In other violence, at least four people were killed in a suicide bomb attack outside a mosque in the mainly Sunni city of Falluja, west of Baghdad.